Penguin United, a company established by gamers, has announced a new peripheral shooter addicts will surely want. 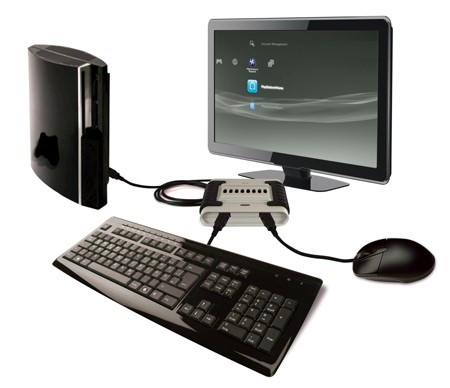 The Eagle Eye lets you connect a USB keyboard and mouse direct into your console, giving you that PC first-person shooting experience the PlayStation 3 has been sorely lacking. Reviews of the device during the recent E3 gaming event praise the accuracy and speedy response of the commands. You can also program functions of one-button combos. Setup takes less than a minute and you’re off blasting away at enemy soldier, zombies and what not. While all this might give you an unfair advantage over opponents, I’m sure the $60 (€48) peripheral will at least assuage that guilt by letting you own each of your gaming rivals.